When you’re training at the range or just enjoying a leisurely hour of target practice, you always want to chamber a cartridge that’s going to perform -- but without burning a hole in your wallet. 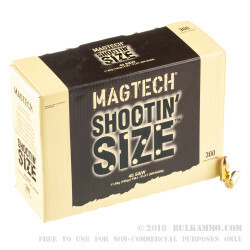 Magtech, a company that prides itself in offering a solution to meet every shooter’s needs, provides just the solution with their Shootin' Size line of ammunition which comes in one box that's big enough to last you a whole range session. This 40 S&W cartridge features a 180 grain projectile. It is ideal for target practice because it has a flat nose, which punches clean holes through paper that are not only easily visible, but distinct enough to remove any ambiguity from the scoring process. 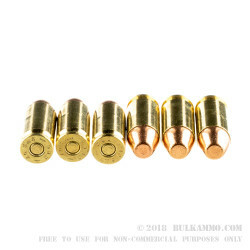 This bullet also sports a full metal jacket, a great feature for extended range sessions because you’ll be able to fire longer in between cleanings without losing as much of your accuracy. 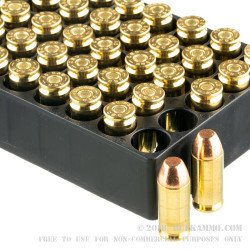 This cartridge comes with a non-corrosive Boxer primed brass casing, so you will be able to reload to stretch out its life for several trips to the range. Great all a round. A + in every category category.